While looking around my house to find something to up-cycle into a Valentine's gift, I felt a familiar snap under my foot as a poor grey crayon—recently new—snapped in half. Sure, I could be more delicate with them, have my daughter only use them on the table, and keep them in a sturdy box, but you have to choose your battles. And to be honest, I’d rather just buy a new box of crayons. But that doesn’t mean I don’t feel bad about the many fallen soldiers that eventually end up in the trash. So at the moment that grey crayon met its fate, I thought, what can I do with these things?! I knew melting crayons was a thing, so I googled how to do it, got a cheap silicone mold, and tried to make something whole out of something broken. One trick I learned is to soak your crayons in water for a minute or two, which makes taking the wrappers off a breeze. And if I had been smarter I would have put my silicone mold on a baking sheet to give it more stability. As you can see, inevitably some molted crayon splashed around and onto my counter top. 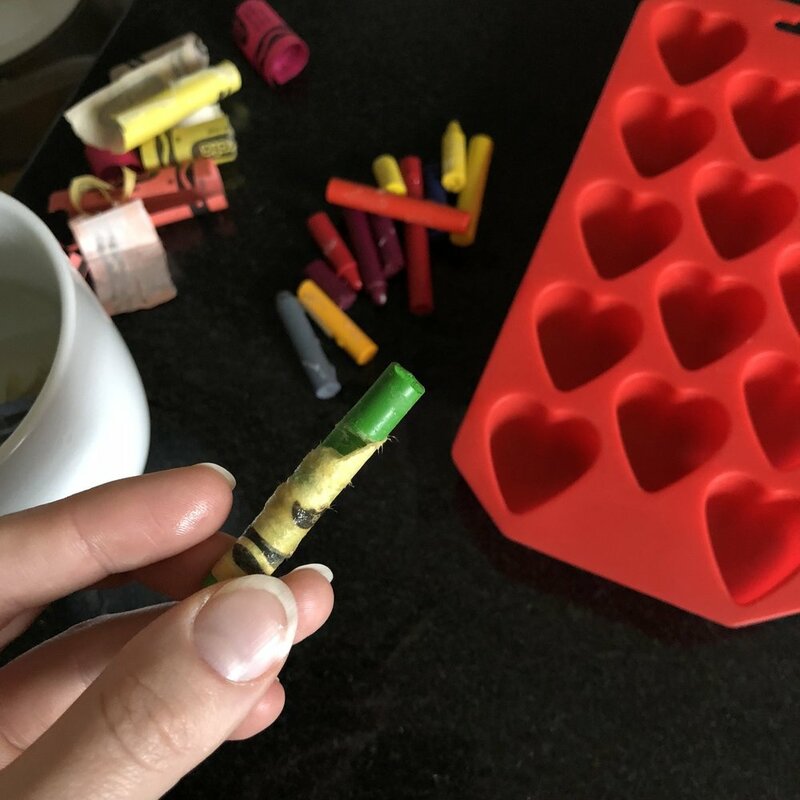 But 15 minutes of “cooking” at 230°F and 5 minutes of cooling resulted in totally fun heart-shaped crayons! They make a simple gift, but one that Ivy and I can use together. 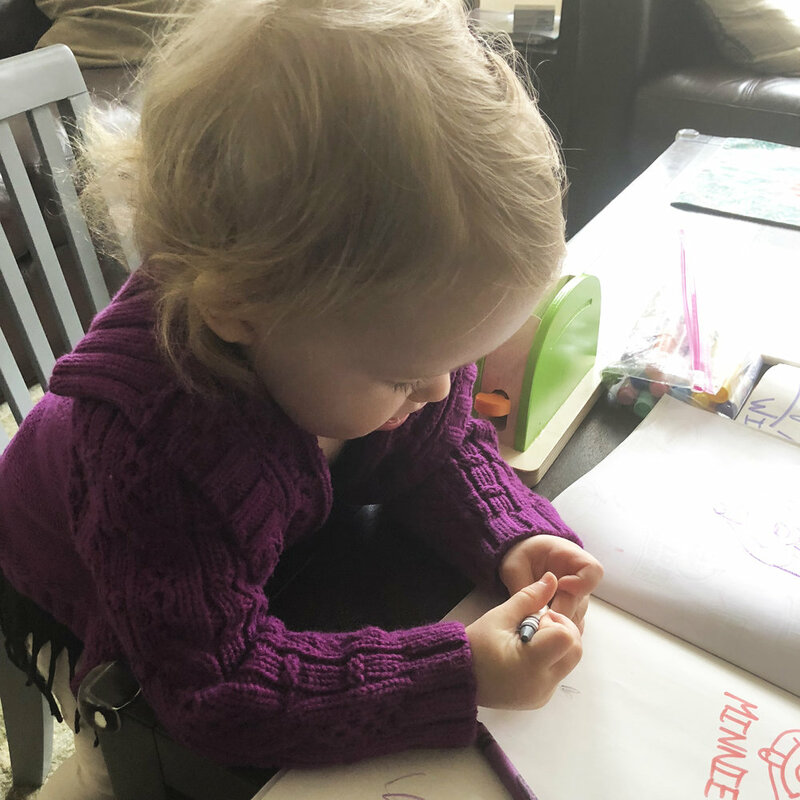 And since she has my whole heart (gosh, I couldn’t love this kid any more! ), a heart crayon for Valentine's Day seems more than appropriate. And if you can’t tell from the pic, she’s really into the letter "E."